Mr. San Roman joined Mt. San Rafael Hospital in 2005 as a Registered Nurse. However, after many years serving in that capacity for a variety of departments, Mr. San Roman now serves as a Family Nurse Practitioner providing for the medical needs of acute care patients utilizing the Mt. San Rafael Hospital Walk-In Clinic. 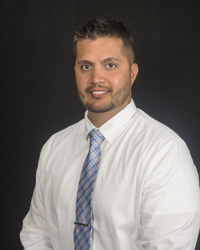 Mr. San Roman obtained his bachelor's degree in nursing from Chamberlain College of Nursing in Jacksonville, Florida, then went on to receive his master's degree in nursing, Family Nurse Practitioner and Acute Care Nurse Practitioner at Colorado State University-Pueblo. Mr. San Roman is board certified in Adult Gero/Acute Care Nurse Practitioner and Family Nurse Practitioner. Mr. San Roman attributes his medical philosophy to the Theory of Self-Efficacy, from Middle Range Theorist Dr. Barbara Resnick, PhD, CRNP. This theory states, "self-efficacy expectations and outcome expectations are not only influenced by behavior, but also by verbal encouragement, psychological situations, exposure to role models, or self-modeling." In summary, as providers, we need to instill positive focus and empowerment through understanding the individual's knowledge vs. personal experience, vs. perceived experience. What are the barriers, the benefits? What is their support system and how do we help patients achieve their goals? Lastly, understanding that both internal and external influences can't always be controlled, but are to be expected, will help the patient commit to their plan of care. Mr. San Roman enjoys spending time with family outdoors, cooking, mountain biking, wood working, reading, and watching his kids play sports or participate in 4-H activities.